This month´s CBBH photo challenge theme is Blue - not a difficult theme when living in the land of Blue Sky (she says tongue in cheek as it´s been grey and wet for a week or more). My gallery of photos says differently. Marianne, CBBH host and writer of East of Malaga says that “Over the ages blue has become associated with steadfastness, dependability, wisdom and loyalty..."
It´s is such a solid colour from the mass of blue ocean and sky we get such a feeling of revival, awakening and peace. Here are a few of my offerings. Vivid blue waters of the marina and sky in Fuengirola on a July day. I love the way the deep blue in the above this statue in Puerto Banus fades to pale blue almost white in the distance. Here their are different shades of blue in the sky and the reservoir contrasting with the green olive trees in the foreground. 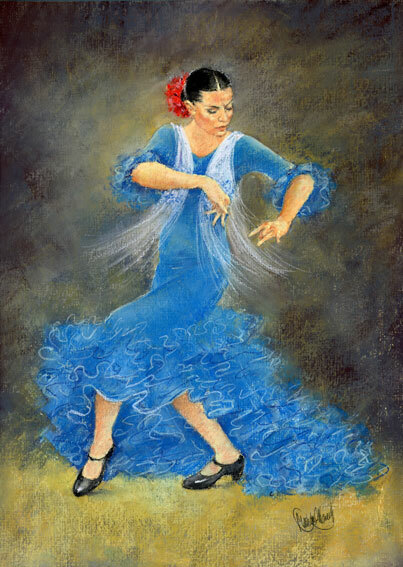 Elegance and style Flamenco dancer in blue in this painting by the English artist Margaret Merry who lives in Spain. I´m going to share, as requested, two blogs I like to follow one is a Spanish food blog, Al Sur de Sur which translates to the south of the south written in Malaga. The second is Sevilla Tapas who does fantastic tapas tours and more recently flamenco and tapas tours in the heart of Sevilla. You might well imagine from the above I like food - it´s true and especially Spanish food. Read my Tapas Cooking Course post or visit my holiday home page and see the cookery classes my Spanish brother-in-law runs.